MESQUITE, Nev. - Federal land managers say "escalating tensions" led them to release all 400 or so head of cattle rounded up on public land in southern Nevada from a rancher who has refused to recognize their authority. The rancher at the center of the dispute said it was "the citizens of America" that brought the standoff to an end. Bureau of Land Management Chief Neil Kornze announced an abrupt halt to the weeklong roundup just hours before the release. "Based on information about conditions on the ground and in consultation with law enforcement, we have made a decision to conclude the cattle gather because of our serious concerns about the safety of employees and members of the public," Kornze said in a statement. Hundreds of states' rights protesters, including militia members, showed up at corrals outside Mesquite to demand the animals' return to rancher Cliven Bundy. Some protesters were armed with handguns and rifles at the corrals and at an earlier nearby rally. Bundy told CBS affiliate KLAS in Nevada that it was his protests and his supporters that concluded the standoff. "There is no deal here. The citizens of America and Clark County went and took their cattle. There was no negotiations. They took these cattle," Bundy said. Prior to the meeting that resolved the issue between the two sides, hundreds of protesters, some armed, tried storming the BLM's cattle gate, but weren't successful. The crowd was urged to wait 30 minutes and give both sides a chance to talk. Las Vegas Police Lt. Dan Zehnder said the showdown was resolved with no injuries and no violence. Clark County Sheriff Doug Gillespie was able to negotiate a resolution after talking with Bundy, he said. The fight between Bundy and the Bureau of Land Management widened into a debate about states' rights and federal land-use policy. The dispute that ultimately triggered the roundup dates to 1993, when the bureau cited concern for the federally protected tortoise in the region. The bureau revoked Bundy's grazing rights after he stopped paying grazing fees and disregarded federal court orders to remove his animals. Kornze's announcement came after Bundy repeatedly promised to "do whatever it takes" to protect his property and after a string of raucous confrontations between his family members and supporters and federal agents during the weeklong operation. Republican Nevada Gov. Brian Sandoval issued a statement praising the agency for its willingness to listen to the state's concerns. He earlier criticized the agency for creating "an atmosphere of intimidation" and trying to confine protesters to a fenced-in "First Amendment area" well away from the sprawling roundup area. "The safety of all individuals involved in this matter has been my highest priority," Sandoval said. "Given the circumstances, today's outcome is the best we could have hoped for." Nevada's congressional delegation urged the protesters to be calm and to leave the area. "The dispute is over, the BLM is leaving, but emotions and tensions are still near the boiling point, and we desperately need a peaceful conclusion to this conflict," U.S. Sen. Dean Heller, R-Nev., said in a statement. "I urge all the people involved to please return to your homes and allow the BLM officers to collect their equipment and depart without interference." The 400 cows gathered during the roundup were short of the BLM's goal of 900 cows that it says have been trespassing on U.S. land without required grazing permits for over 20 years. 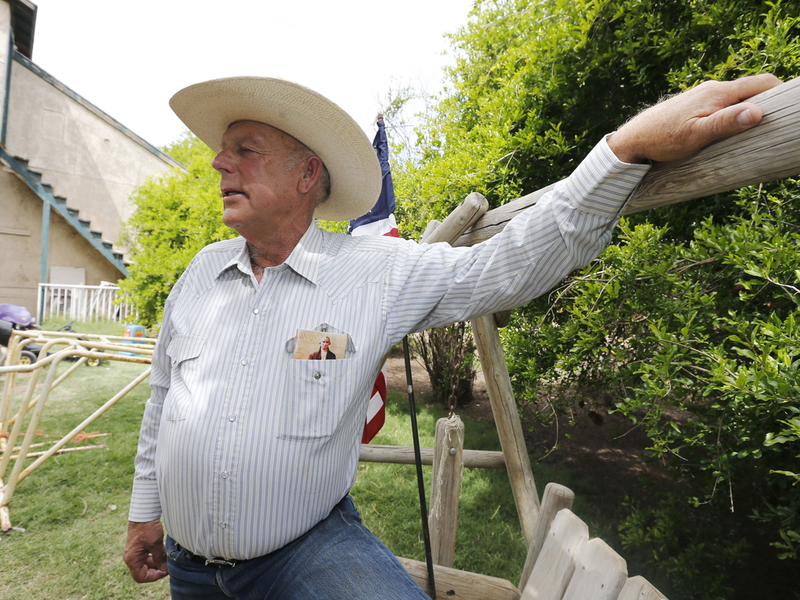 Bundy, 67, doesn't recognize federal authority on land he insists belongs to Nevada. His Mormon family has operated a ranch since the 1870s near the small town of Bunkerville and the Utah and Arizona lines. "Good morning America, good morning world, isn't it a beautiful day in Bunkerville?" Bundy told a cheering crowd after his cattle were released, according to the Las Vegas Review-Journal. The crowd protesting Saturday recited the pledge of allegiance, and many offered prayers. Others waved placards reading, "This land is your land," and "We teach our children not to bully. How do we teach our government not to be big bullies?" according to the newspaper. It's the latest skirmish since the 1980s when the Sagebrush Rebellion challenged federal ownership of Nevada rangeland ranchers said was rightfully theirs. A federal judge in Las Vegas first ordered Bundy to remove his trespassing cattle in 1998. The bureau was implementing two federal court orders last year to remove Bundy's cattle after making repeated efforts to resolve the matter outside court, Kornze said, adding the rancher has not paid grazing fees in 20 years. "This is a matter of fairness and equity, and we remain disappointed that Cliven Bundy continues to not comply with the same laws that 16,000 public-lands ranchers do every year," Kornze said. "After 20 years and multiple court orders to remove the trespass cattle, Mr. Bundy owes the American taxpayers in excess of $1 million. The BLM will continue to work to resolve the matter administratively and judicially."